Image caption Mr Obama said that however horrific conventional arms were, chemical weapons would "cross another line"
US President Barack Obama has vowed a "vigorous investigation" into reports that Syria has used chemical weapons, warning they will be a "game changer" for US policy if proven true. Both the US and UK have pointed to emerging evidence that Syria has used weapons such as the nerve gas sarin. UK Prime Minister David Cameron earlier told the BBC it appeared a war crime was being committed by Syria. 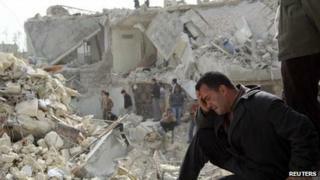 According to the UN, at least 70,000 people have been killed in the two-year uprising against Syrian President Bashar al-Assad. Mr Obama was speaking as he met King Abdullah II of Jordan at the White House. The US, Britain, Israel and others have been collecting evidence to try and determine whether chemical weapons have been used in Syria. The signs so far are that they have been, but politicians are being cautious of over-selling their level of certainty. This is partly because of the lesson of Iraq, when too much was based on too little hard information and all the caveats and cautions surrounding intelligence were lost. And also partly because this time the political context is different. With Iraq a decision had been made to go to war and the intelligence was brought into the public domain to make the case for it. This time political leaders - especially in Washington - seem much more reluctant to intervene and so the emphasis is precisely on the caveats and cautions. Given the problems of getting access to a warzone to gain conclusive evidence, finding absolutely definitive evidence may be hard and take time. This may buy politicians in Washington and London time to work out what they do if something is found. The US president said there was "some evidence that chemical weapons have been used on the population in Syria, these are preliminary assessments, they're based on our intelligence gathering. "We have varying degrees of confidence about the actual use, there's a range of questions about how, when, where these weapons have been used," he said. Mr Obama insisted more evidence was still needed and that there would be a "vigorous investigation". But proof of their use would be a "game changer", he said. "Horrific as it is when mortars are being fired on civilians and people are being indiscriminately killed, to use potential weapons of mass destruction on civilian populations crosses another line with respect to international norms and international law. "All of us, not just the United States, but around the world, have to recognise how we cannot stand by and permit the systematic use of weapons like chemical weapons on civilian populations," he said. White House spokesman Jay Carney insisted there was no timeline on how long it would take to corroborate the evidence on the use of chemical weapons and admitted that the case was "not airtight". Media captionPresident Obama: "To use potential weapons of mass destruction on civilian populations crosses another line"
He said all options remained on the table. Mr Obama had earlier said the use of chemical weapons by Syria would cross a "red line". More direct action against Syria could include a no-fly zone and arming rebels. However, Western governments fear the weapons could fall into the hands of extremists, while a no-fly zone would require nullifying Syrian air defences - a major military operation. The Syrian government has dismissed claims that its forces have used chemical weapons. Information Minister Omran al-Zoubi, quoted by the state news agency Sana, said the Western accusations "do not have any credibility". Earlier Mr Cameron told the BBC's political editor Nick Robinson: "I choose my words carefully, but what I see does look very much like a war crime is being committed in our world, at this time, by the Syrian government." The prime minister addressed concerns about the quality of the UK's intelligence and fears that unreliable evidence could again be used as a justification for the West to become involved in a Middle Eastern conflict. But Mr Cameron expressed concern that international action in Syria may be being held back because of fears of a repeat of the Iraq war. "I do worry about that," he said. "Let me absolutely clear, I think the Iraq lesson must be about how we marshal and use information and intelligence and I think that lesson has been learnt. "But I think it is very important for politicians and leaders of this generation to look at what is happening in Syria and ask ourselves what more we can do." Meanwhile, opposition activists and Syrian state media reported fierce fighting between government troops and rebels in a number of suburbs of the capital, Damascus. Activists reported clashes in the Barzeh district of northern Damascus, saying that the army and pro-government militiamen had pushed into the area backed by tank fire. Sana news agency said troops had killed a number of rebels in the Jobar and Zamalka districts of the capital.